Owned and Operated by Attorney's Services, Inc.
Myers Attorney’s Services is a family business, offering quality Hot Springs and Arkansas-wide process service and related services since 1963. Whether you need lots of documents served, need courier services, need background checks, need an investigator, or need document services, you can count on Myers Attorney’s Services for help. We have been helping clients for almost four decades and have established ourselves as a full-service professional company, always willing to help. Just call our team today to find out what we can do for you. At Myers Attorney’s Services, we are able to offer exceptional service because we have hand-picked an excellent team. All of our Hot Springs process servers, for example, are certified by Arkansas courts and have received extensive training, including in-classroom courses. This ensures the best quality of process service. In fact, from the moment your documents arrive in our offices, they are only ever handled by professionals who understand the importance of legal documents. At Myers Attorney’s Services, we understand that if a document weren't vital, it wouldn't have to be served. That's why we treat each assignment with the utmost care and respect. Many things have changed in the nearly forty years we have been in business, but the one thing that hasn’t changed is our absolute commitment to our clients. We do everything possible to ensure that we are thrilled with our service. We hire only the best possible process servers and we offer expedited service. Myers Attorney’s Services also offers timely updates about the status of your request online or over the phone. In addition, we offer a range of service, from private investigation services to document services, to ensure that you have more hassle-free solutions. If there is ever anything we can help with, we sincerely hope you will give us a call. Our friendly and expert staff is always willing to help. Process Service: Our trained and experienced Hot Springs process servers are court certified and have extensive training and experience, ensuring you get the highest quality process service possible. We offer process service across Arkansas, across the US, and around the world through our network of professional process servers. Private Investigation Services: Our investigative team has experience with disability investigations, asset searches, domestic investigations, and other private investigations. Myers Attorney’s Services is part of WAD (World Association of Detectives) and other professional associations. Document Services: Our staff offers document retrieval services across Arkansas as well as document preparation services for subpoenas, case filings, and other documents. Courier Services: Do you have documents that need to be delivered anywhere in Arkansas? We offer pick up and drop off services anywhere in the state. Background Check Services: Our private investigators can conduct professional criminal, civil background checks, and asset background checks. In addition to these services, Myers Attorney’s Services is always willing to consider specialized services and solutions for our clients, so if you need a type of help not listed here, contact the Myers Attorney’s Services team to find out how we can help. Please mail all documents to our Corporate office in Little Rock! 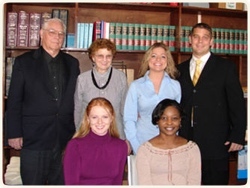 The Myers Attorney’s Services staff frequently gets asked a few questions. Read our FAQ about service of process or contact our team to get the facts about service of process in the state. Why is process service important? Process service ensures that everyone in a legal action is informed of the action and has a chance to reply. Without this system of verification, some people might never get their day in court and it would be much harder to prove service in cases where someone in a case claims he or she did not receive their court documents. Process service reduces these types of problems. Can't I just mail legal documents through a courier? While courier services are very convenient, they do not replace process service. While you can get a confirmation of delivery with a courier, you cannot confirm who actually received the documents. Process servers offer an affidavit of service, which can prove in court that a target was served in accordance with the law. What happens if someone wants to elude process servers? Unfortunately, this does happen. The process servers hired by Myers Attorney’s Services have extensive experience as well as training just for this type of situation. Our process servers will communicate with you about attempts at service and will use all legal resources to get your documents served. In some cases, the documents can be served in a public place that a target frequents, for example. Feel free to contact Myers Attorney’s Services today if you have additional questions about service of process. Call us at (501) 781-0883 or fill out our form for a qualified process server. © Copyright Attorney's Services, Inc.. All rights reserved.